With the Airport Operators Association annual conference opening today (as noted elsewhere in BTN, and for the first time the airline industry organisations involved too) we feature another side of the air travel business, the actual hardware. 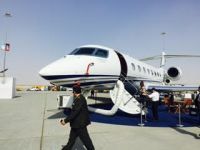 Alison Chambers reports from the Dubai AirShow. The biennial Dubai AirShow is always a popular fixture in the aviation calendar. As the skies turn grey and daylight hours diminish in the UK the enticement of guaranteed sunshine and an easy to navigate show (at the Dubai World Central Jebel Ali venue), is welcome. A seven-hour day flight with Emirates aboard the roomy A380, even in Economy, is pleasant too. Terrific IFE, attentive flight attendants, comfortable seats, no Jennifer Aniston in a bath-robe asking for the shower, but you really do arrive fresher. It was clear from the outset as overseas observers noted the ‘quietness’ of the show that the hiatus of 2013, when a bonanza US$200bn of new aircraft orders were placed by the leading Gulf carriers, was not going to be repeated. Out on the static there was something for everyone amidst the 150 aircraft on show. Qatar Airways showcased its newly delivered Gulfstream 650ER, the first of 30 headed for its Qatar Executive division; its 25th newly delivered 787-800, an A380 and A350. Emirates showed off an A380 and an Embraer Phenom 100 light jet, recently selected by its Training Academy. The A400M military turboprop (the very same aircraft that Tom Cruise hung out of at speed in his latest Mission Impossible epic) and the reborn Twin Otter 400, exhibited by Canadian company Viking International’s Middle East distributors Veling Tayara were among the attractions. Dubai-based Veling Tayara announced the first non-commercial sale of the aircraft to Skydive Dubai, the UAE’s prolific parachuting company. They wanted the aircraft in time for the World Air Games, which start in Dubai on 30 November. The biggest order of the show was placed by Vietnam’s low-cost carrier VietJet, whose stylish CEO Mrs Nguyen Thi Puong Thao flew in to sign for 30 new Airbus single aisle aircraft, including 21 A321neos in high density 240-seat layout. India's Jet Airways, partially owned by Etihad, confirmed an order for 75 Boeing 737 MAXs, although this deal was previously attributed to an unidentified source. Bombardier’s Head of Commercial Aircraft Fred Cromer, making his debut at the show, complemented by a Swiss clad CSeries available for viewing, announced a launch commitment for the larger CSeries -300 from Latvian carrier Air Baltic (13 aircraft plus seven options.) Deliveries will commence at the end of 2016, post certification which is on course for the second half of the year. Airbus confirmed IAG had firmed up orders for 19 aircraft (four A330s and 15 A320neos). The A330s are destined for Iberia and Aer Lingus while the A320neos will be divided among the group. Airbus also announced an ACJ319neo sale to a private buyer which will be operated by German business aviation operator K5 Aviation and chartered exclusively by Vertis Aviation. Separately an ACJ319 offered for sale on the static by 28 East was a further attraction for the business aviation fraternity which surprisingly, being so close to the NBAA Show in Las Vegas, had a good showing. 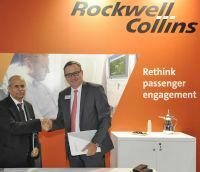 Rockwell Collins had a strong show, announcing several contracts with Middle East carriers including Jazeera Airways’ signing as the first airline customer for its PAVES™ inflight entertainment and connectivity (IFEC) solution. Kuwait’s LCC will install PAVES Cabin Wireless and Inmarsat Global Xpress (GX) connectivity on its fleet of seven Airbus A320 aircraft from December 2016. Regardless of the temporary pause in orders, the OEMs still maintain the Middle East is the fastest growing market for new aircraft. John Leahy, Airbus COO for Customers, cited that air traffic in the region will grow 6.0% over the next 20 years, above the world average of 4.6%, demand that will command some 2,460 new passenger and freighter aircraft valued at US$590bn. Boeing too is optimistic, predicting a demand of 3,180 new aircraft over the next 20 years, worth US$730bn, 70% of demand coming from fleet expansion and the rest to replace aging aircraft. Embraer Aircraft, which brought its new Legacy 500 business jet to the show for the first time, highlighted the region’s strong demand for aircraft in the 70 to 130-seat category. It will be pushing for order success for its new E2 family alongside Sukhoi’s SuperJet International. Recently buoyed by its order from Ireland’s CityJet, it was showing an SSJ100 in InterJet of Mexico’s colours out on the static. While in Dubai she took time out to talk to IAWA, the US-headquartered International Women in Aviation organisation which brought its 27th annual conference to Dubai. IAWA is an impressive and expanding group, now in its 27th year, set up by ex-Emirates aviation lawyer Carol Anderson. A strong line-up of local and international speakers gathered during the show to discuss topical themes. The GCAA’s Assistant Director General Laila Ali Hareb Al Murhairi was among the speakers. Writing in Arabian Aerospace she praised the UAE for the important role it is playing to inspire other nations to focus on girls and education. “UN statistics indicate the UAE is among the most developed nations in educating females under a compassionate government. Women in the UAE have blossomed and it’s about time we see fair representation of local women in male dominated sectors,” she said. Weary feet are synonymous with air shows so the Emirates’ haven that is the business departure lounge at Dubai International was exceedingly welcome. Well-appointed with a range of healthy refreshments, juices, drinks and well stocked international reading material, but the biggest advantage is the dedicated Business and First Class boarding. Straight up in the elevator for check in, no queuing.